and also Frame et. al. (2004) 'Constraining climate Forecasts'. There is also a 2006 paper, to which I have no access on the subject. These all seem to indicate that it is not plausible to eliminate extreme climate sensitivities through probabilistic analysis, and that the TAR, for example, failed to consider the full range of potential sensitivities. I don't pretend to have a full grip on the maths, but the conclusions do seem to run counter to your own. Note: Though this is my first posting, I do regularly read your and aother blogs, and enjoy them enormously; keep up the good work. My position is simple: I think they are wrong, and indeed I think their errors are very obvious indeed, to the extent that it is rather embarassing that they continue to pretend that they are right. That is not to say that I claim that our result is a perfect answer, but it is a sensible (albeit rather simplified) stab at one and seems remarkably robust to plausible sensitivity tests. I hope to see other researchers produce more carefully calculated estimates, taking account of the points we have made. I'm confident that when they do this, they will agree quite closely with us. Note, however, that Stainforth et al actually made no probabilistic estimate. I'm not sure what 2006 paper you mean, but all the cpdn ones are available through their website. I see your presence and comments on other blogs, such as No se nada, so I'll keep it brief. In one sense, I can see that your methodology is self-evidently going to produce a more 'reasonable' result, but it still leaves us with the problem of identifying the 'initial value' [f/O]. Isn't the point of the 'ignorant prior' to avoid the issue entirely by placing a value range which is so great as to encompass all possibilities? Surely, though, this will invariably result in a higher percentage value for sensitivities outside the standard distribution range. Therefore, the findings in the other papers are not unexpected, but they are a function of the mathematics, not the climate itself. If this is the case, then there can be no value placed on results based on an unmodified 'ignorant prior'. So can't we get rid of it entirely? How does Bayes formula operate if the 'initial value' (the assumed value by the scientist) is eliminated, and replaced with a function which represents instead a 'constrained value', which the is limited by justifiable by existing evidence? I hope this makes sense; it's at the edge of my comfort zone. One final observation: I've read more than one paper this year (most likely in relation to the PCMDI output) which has suggested that Bayesian methods are more effective than PCA or fingerprint analysis methods; your finding might imply otherwise; any comment? Damn you, I had to do some studying on Bayes Theorem! As a result, it appears that the idea of an 'ignorant prior' simply cannot be applied. Part of the reason for this is that the theorem specifies that the form of the posterior must be consistent with the form of the prior; therefore there will always be a broad range of sensitivities following from a broad ranging (a conjugate?) prior. I also note that the Stainforth paper does have an (implied) uniform prior in the form of the control, Tg, yet still manages to draw out results beyond the 8C threshold, albeit a small percentage. It also specifies that none of the variables are perturbed beyond an accepted (another prior?) range. So, how do we then avoid the conclusion that a climate sensitivity greater than 6C cannot be ruled out? And remember, this is model output, not probability, that we are dealing with here. If, on the other hand, we were to make use of the standard distribution of results from the paper, and narrow this (or is this too random?) to the 5-95 percentile, or even the 10-90 range, we could end up with a potential prior within the range of approximately 2-> 6 C. What happens to the numbers in the Frame methodology if f[s]= 2-6C? Not surprisingly, the long tail vanishes and the numbers end up closely rembling your own, if perhaps with a slightly higher probability of sensitivity being >3C. Perhaps you can suggest this to Dave Stainforth or his colleagues? Sorry if my maths or logic stink; I'm doing my best. Don't know why James hasn't answered, but I'll have a go. Can you really imagine James, who hates uniform priors, really suggesting a uniform prior from 2 to 6 should be used to Stainforth/CPDN/Piani et al? In any event what does your prior achieve? The posterior has no probability of sensitivity of over 6 but that is because your prior has ruled it out a piori. So that is not really a sensible way of deciding that sensitivity is not greater than 6. That prior also says there is an 25% chance of sensitivity being in the 2-3 range, the 3-4 range, the 4-5 range and the 5-6 range. If there is a lot of background information that was known before the data you are using to refine the PDF that says that the 2-3 and 3-4 ranges are rather more likely than the 5-6 range then your prior for a best credible estimate of probability should reflect that. What I would like to ask is if this means you should have different priors for different purposes: If you want a best credible estimate then you need to do the best you can will all the information that is available and not used in the analysis (so as to avoid double counting the evidence). If you want to consider whether the probability of sensitivity over 6 can be ruled out then do you need to consider the possibility that there may be reasons that haven't been considered as to why the sensitivity could be higher than indicated by the observations? Is this best dealt with by a prior that gives higher probability to sensitivities of over 6? So should we have different priors for different purposes? BTW James also thinks the 'cannot be ruled out' language is misleading. If you believe in priors having long tails then it is hard to rule anything out at the 0.0000001% level but it may well be possible to rule things out at the 5% level. Thanks, Crandles; I know your handle from elsewhere on the net; your reply is appreciated. You spotted the disingenuity, then? More seriously, James' paper has encouraged some more research on uniform priors and model parameters, leading to some disturbing reading: Hansen et. al., Dec. 2006; 'Dangerous human-made interference with climate'. It's worrying because of the description of the GISS E's known deficiencies and the climate forcing uncertainties. One thing it has led me to is a worry that we seem to be no closer to establishing the equilibrium climate sensitivity now than we were ten years ago. This has led me to email Gavin & the RC 'krew' on the subject. Back to the subject; if you can't have an 'ignorant' prior, and the posterior is constrained by a 'uniform' prior, what does Bayes theorem actually do? It seems that James' paper shows a limitation of the application of Bayes theorem to climate sensitivity calculations, or perhaps to any hypothesis involving unresolvable uncertainty in the prior; you can't apply it unless you 'think of a number', as it were. BTW; GISS E uses an assumed ECS of 2.7C or 2.9C, [ocean model dependent]; HADCM3 uses 2.5C [in at least one recent paper]; James is saying ~3C; are we reaching some kind of consensus, at last? regrads, and a happy new year. >if you can't have an 'ignorant' prior, and the posterior is constrained by a 'uniform' prior, what does Bayes theorem actually do? It seems that James' paper shows a limitation of the application of Bayes theorem to climate sensitivity calculations, or perhaps to any hypothesis involving unresolvable uncertainty in the prior; you can't apply it unless you 'think of a number', as it were. You can't have an ignorant prior and the posterior is constrained by a prior which isn't necessarily uniform. What you can do (and James has done) is play about with plausible (i.e. non uniform) priors. If the prior matters agreat deal to the posterior then your evidence isn't good enough yet. If you play about and the most extremely different of your plausible priors makes little difference to the posterior then your evidence is good enough. James claims this is the case. So, the better the evidence, the less variation in the posterior when starting from two different priors. So why don't papers show the effect from two different priors in order to show how much effect the prior has? I am told that "Chris Forest about has managed to skate through this whole prior thing unscathed by showing both expert and uniform priors. It's very sensible practice." By choosing silly enough priors, one can always generate a wide range of posteriors. So there still needs to be a judgement about what priors are reasonable. IMO U[0,20] fails any "reasonableness" assessment and I note that no advocates of uniform priors have ever actually claimed that they describe a reasonable prior belief (instead they claim erroneously that a uniform prior represents ignorance, or even that they have invented a whole new approach to probability, or else they just duck any discussion of the matter). You have brought up the [0,20] prior again. I can understand your focus on Frame et al as that is the paper that recommended uniform priors. However you frequently use the [0,20] prior used in that paper and I think that is a bit OTT. If you think that U[0,20] is an unreasonable choice then you're already in agreement with me - but it would be more useful to see a plain acceptance of this from those who used it! But more generally I do accept your point that this is not merely about that one particular prior. One reason I quote it is because it is not always that clear what bounds other people have used on their uniform priors - in fact it seems quite likely that most people don't even realise how much this matters. I have to wonder to what extent even F05 realised this, as it seems inconceivable that they could recommend a uniform prior without discussing this aspect. In fact the most enthusiastic ref thought that this (the dependence on the upper bound) was an especially important aspect of our manuscript. Thanks to both of you for pursuing this subject; it is becoming much clearer to me (& others, I trust) as a result. Is this a reasonable conclusion to make from the paper and your follow-on comments? The conclusion appears to be that the application of a 'uniform' prior is not really of value in creating a realistic PDF for climate sensitivity, except in hypothetical/statistical applications; in other words, not in the 'real world'. If the Frame et. al. paper shows anything, it shows that 'climate forecasts' do need to be 'constrained' by the application of at least some assumptions. An important point arises from one comment here, and Gavin's reply to my email to RC; as the evidence improves, and the posteriors approach equivalence, the priors become less significant; therefore it is not really worth getting 'fixated' on the values of the prior, so long as they don't unreasonably constrain the posterior. Your suggestion of running with two (or more?) plausible priors, perhaps at the extremes and the mean of existing best-fit estimates, then considering the range of the posterior, is a good idea, in particular as this would be a good test of the validity of the evidence - the range being narrowest where the evidence is most robust. A final point, James: I am sure Gavin Schmidt won't mind me telling you that in his email to me he said he likes your paper; is this enough of a spur to get you to reconsider sending the paper for publication again? It does seem that what you have demonstrated is of sufficient importance to justify 'legitimisation' in the peer-reviewed press and, like it or not, it would make a difference to the status of the paper which, IMO, needs to be taken on board by the 'statistical branch' of climate science at the very least. As for the paper, well I will certainly present it at the EGU and hope it will generate some useful discussion. But almost all of the scientists know about it already, I can't control whether they cite it and deal with the arguments raised, or try instead to ignore it. I'm not convinced that peer-reviewed publication will make much difference on that score. You likely have all your workings at the ready. So why not whack up some quick results for what you would hypothetically get if your priors were -3 degrees, -2 degrees, -1 degree and 0, 1, 2 and 2.5 degrees respectively? 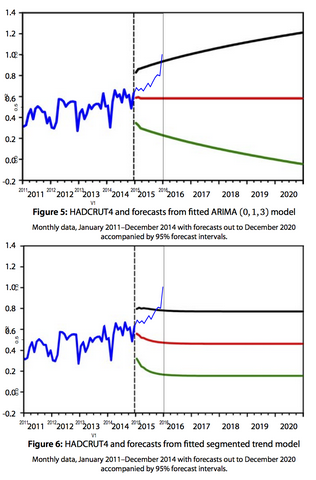 Because leaving that 2.5 degrees estimate just lying around amounts to alarmist propaganda. And right now we have to start building as many coal-electricity and coal-liquid fuel generators as we possibly can. I see your estimates quoted all about the place as the final word on the subject. If you actually did the above, just as a quick estimate, it would put these things in perspective for a lot of people. Of course you'd also have to mention that this doesn't take into account any change in solar activity. And say whether you're using data that integrates Antarctica, the ocean air and the Southern Hemisphere more generally as well as data that excludes any heat island effect. We need to know this stuff for sure. For you it would be just a matter of plugging in the other priors and you get the results right away. A prior can't (meaningfully) just be a single value, it has to have a range. Changing the range within (IMO) reasonable bounds has a rather small effect on the results. But anyway, I know from bitter experience that weight of argument does not always convince people, and "a man convinced against his will, is of the same opinion still". So rather than presenting "the answer" I see the process more as putting the argument out there, and waiting for others to come to similar conclusions. If anything, this is even more important than usual when talking of Bayesian analysis, since different priors are legitimate in principle. Why not for the purposes of the general enlightenment throw some dummy ranges through your pre-sorted equations? Its no great problem if people are sticky in their thinking outside the profession. What worries me is that the political poison has invaded right into science-worker territory. If the politicisation, and the public-funding-influenced corruption has pierced too deeply into your profession, then we may have to go through an extended clobbering-time in order to bring matters back to a reasonable sense of decorum. I wouldn't expect YOU as a prominent and authentic scientist to necessarily be doing the clobbering. Do you feel that the situation has gotten so bad that you have to hide your data for the longest possible time? And even then not present it in the most accesible way possible? "Of course you'd also have to mention that this doesn't take into account any change in solar activity. And say whether you're using data that integrates Antarctica, the ocean air and the Southern Hemisphere more generally as well as data that excludes any heat island effect." I say this because I'm assuming you found it impolitic to set things straight on the above. And in fact I KNOW that your data doesn't factor in or out all these things (as I would wish it) since if it did you couldn't possibly reach the figure you have for any 'decadal' time period. I think that political/institutional imperatives have made it almost impossible to do good science on both sides of this debate. And I suspect the whole paradigm of having a stable or meaningful warming sensitivity to CO2 is just not right for this planet. I assume that you could have such a sensitivity figure for the other planets in this solar system but not for this one planet. The planet EARTH. Its as though the paradigm has been sorted with reference to the other planets in the Solar System. But the problem is that their greenhouse substances are all greenhouse GASSES. But our primary greenhouse 'gas' is liquid water. ..... Well you see unlike the other planets in this solar system, for most time scales, there appears to be a great deal of SERENDIPITY in the system. What I think is needed is people like me to project a sustained level of abuse against various bully-boys. So that some of you fellows, who ought to be doing path-breaking science in this area, can gain the space to be able to do it. And just do it and let the chips fall where they may without having to nuance things for the bully-boy-advocates-of-the-intellectual-status-quo. I can either assume that people are for the most part honest, and wait for them to work out that we are basically right, or I can go and do something else more productive with my time. Your third way isn't attractive to me. Well I said I wouldn't necessarily expect you to do the clobbering. But you might include the other information that I asked about so as to not be part of the problem.
" I can either assume that people are for the most part honest, and wait for them to work out that we are basically right.."
Bad assumption I'd say. Not very scientific. Its a bit of a crisis situation as people are attempting to impose all sorts of costs on us and destroy our ability to produce energy. And thats already going to cause a lot of people a great deal of hardship down the track. It's interesting how people who insist we will have no problem adapting to climate change, simultaneously claim that the world will fall apart under the stress of any shift (however modest) in energy policy. But that's a whole 'nother story. Well the thing is the obstruction to increasing energy production has been going on a very long time now. And it takes a very long time to get energy production going from a standing start. And so there is no doubt we will be in great stress over it. This war is a bit of a symptom of that being as the terrorist-enabling nations now have tons of revenues from pricey oil with which to push the killing. There is no reason for the change to energy policy so it must be opposed. Obviously it will impose costs on people. So its got to be stopped.